Having a newborn in the house is lovely, but when you’re in the middle of seemingly endless sleepless nights, dirty nappies and feeds it can sometimes feel like a test of endurance to make it through the other side. 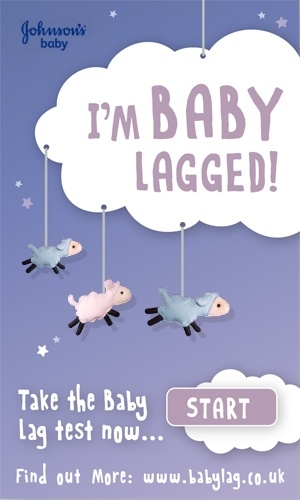 You may even feel that you are suffering from what Johnson’s Baby calls ‘baby lag’ – the physical and emotional effects of a lack of sleep, including lack of concentration, poor memory and feeling less alert. A good baby sleep routine is essential. Try a warm bath followed by a relaxing baby massage and cuddles before bed to send baby off to the land of nod allowing you to follow soon after! Don’t try to be supermum. Offers of help quickly dry up as babies grow, so accept all offers as and when you get them! It’s important to make sure that your partner helps out wherever possible. Tempting though it may be to hole up at home for the foreseeable, getting out and about in the fresh air will perk you up and help your baby to know the difference between night and day. Don’t worry about the ironing or cleaning the bathroom for a while. There will always be time for housework later. Your priority right now should be recuperation and enjoying the time with your baby. Well meaning advice can come at you from all angles but try not to get too hung up on what you should and shouldn’t be doing. Talk through any genuine concerns with your midwife or health visitor but try to take a relaxed approach to parenting – relaxed parents make for relaxed babies! While you might feel like you’re simply surviving day to day at the moment, this difficult first stage is short lived and, with the help of a good bedtime routine, your baby will soon be sleeping through the night making sleepless nights a distant memory. Until the next time, of course….! Great tips! My baby is on her own routine. The Sleep when I want, eat when I want one!